My daughter hates the spoon. She’s 10-months-old, and has always been wary of it. But in the last few months, her wariness has become laced with loathing. This has made feeding time marginally difficult (read: “highly frustrating”). She’s not afraid of it and she loves to play with it and bang it around and chew on it readily, but slop some food on it and it becomes The Thing To Avoid. Her lips lock, her head turns, and her arms start spinning like propellers. At this point, we have three options, cease spoon usage, attempt to sneak the spoon in between spinning propellers and get it into open mouth while she’s laughing or bellowing, or attempt a distraction with a chew toy on one side and a bean-filled spoon on the other awaiting an opening, literally. More often than not, they all seem to result in beans on bib, beans on wall, beans on Mommy, and no beans in baby. We’ve tried metal spoons, plastic spoons, rubber spoons, and have even gone so far as to fashion our own spoons out of other materials. But she’s on to our conniving ways and quickly realizes that a spoon, is a spoon, is a spoon, regardless of the substance. In desperation, I reached out to the Internet to see what wisdom it could provide. I watched with mild amusement several videos on “Introducing solids”. 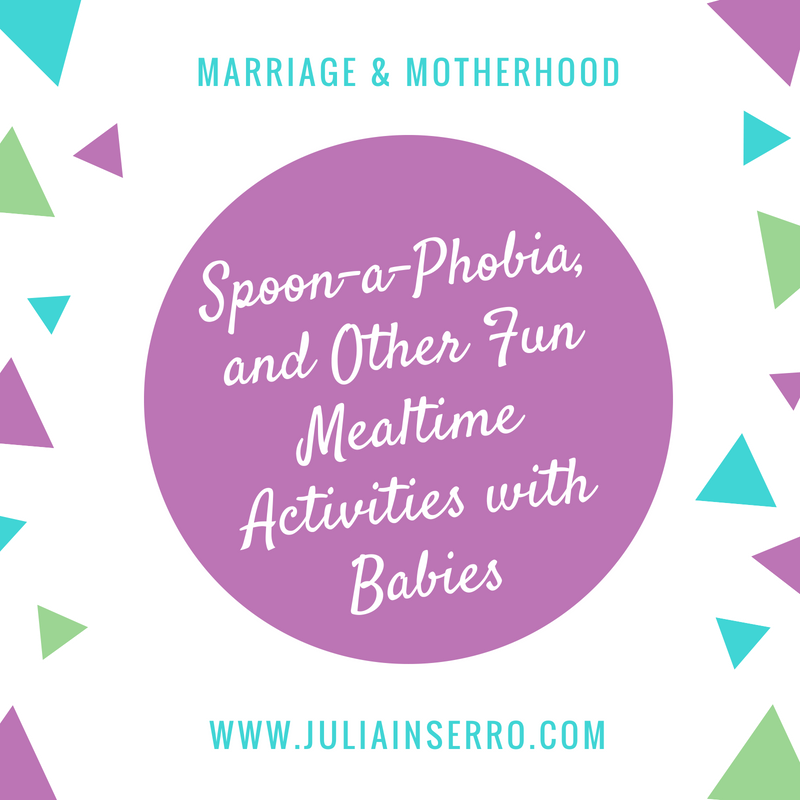 They all showed a spotless kitchen, a happy mommy, and a super eager baby opening his mouth for each heaping spoonful in perfect mimicry of a baby bird. Not helpful. Where was the trashed kitchen, the mommy with green bean puree in her hair and a bit of mashed banana stuck to her forehead, complete with the tight-lipped stubborn (albeit adorable) baby glaring at the spoon like it was here to steal her favorite mouse? So, what is a mother to do? Quite simply, adapt; I just made everything finger-food. Whatever she can’t pick up herself, I just plop in her mouth using my fingers. Yes, it’s messy, but so are propeller-beans. And my hands are far easier to clean than walls and the ceiling. I’ve had to bulk up some of the purees I have with rice or wheat cereal, so I can make little green-bean-balls or apple-balls, before popping it in her mouth. And as long as no one comes to the door or the phone rings, resulting in goopy handles and phones, we’re all good. My husband, however, refuses to give in to her no-spoon no-way insistence. He tries everything to get the dollop of food resting on the spoon into her mouth, including, but not limited to, the dual-spoon-distraction method (which only works if you can get by the arms, see above), using the high-flying airplane act, getting her to laugh and then shoving it in, and my favorite, the spackle method. I’m not sure how much she’s actually consuming, but they seem to enjoy it and since he cleans up afterwards, I keep my mouth shut tight (as if there were a dreaded spoon in my proximity). I can’t deny watching my friends’ babies gobble up food by the spoonful with great fascination. I almost feel like I’m watching a different species. So that’s how it’s supposed to work, I think to myself. It is just like the happy mommies and baby birds on the videos. But, in the long run, as long as our daughter’s trying new foods, getting nutrients in her, and we don’t resort to the use-the-spoon-have-a-pony method, I think we’ll be fine. Parenthood is all about adaptation and flexibility. Oh, and for future reference, dried green bean puree turns to cement with 24 hours, so having a mop with an extra long handle helps, too.